​I usually don’t like going to trade shows in search of wineries. The environment is artificial, with producers in clean, pressed shirts tasting their wines behind a sterile, prefab stand. Not to mention all the attendees milling around in search of a spit bucket or talking about their dinner the night before. I much prefer making the effort to go to the domaine when considering new producers; it is a much more time-consuming process, but ultimately one I find more rewarding. I have gone to large wine fairs a couple of times, however; Vin-Expo (the size of nine football fields) and Vini-Sud (the size of 7 football fields). The only large tasting that I like is Les Grands Jours de Bourgogne, a celebration of wines from that region which takes place every two years. Strictly open to professionals and not a sales event per se, it is an amazing way to learn about the wines of Burgundy. It takes place over a week, with several tastings a day spread around the region. The morning might be Volnay, the afternoon Chambolle-Musigny and Morey Saint Denis. Another day might see tastings in Gevrey Chambertin and Marsannay, and in the afternoon Nuits Saint Georges. It is in no way a flea market for wine like some other tastings around France, but a legitimate way to learn about the region’s complexities while tasting wines from some of its greatest producers. I mean, where else can you taste 40 Corton Charlemagne over the course of a late afternoon. If you didn’t quite understand the appellation before attending this tasting, you damn well have a good idea afterwards. 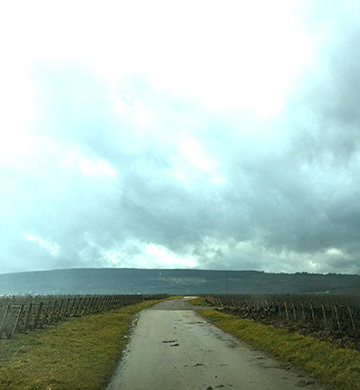 I went to the Grands Jours in 2014 with the goal of learning more about Burgundy sur place. The morning tasting on one particular Friday was Chassagne and Puligny Montrachet, along with Maranges and Saint Aubin. So after tasting hella wines from primarily the 2012 vintage and saying hello to a few producers that I work with, I was ready to head off to Pommard for the next tasting. Just before leaving, I noticed a girl standing on her own under the banner Bader-Mimeur. The name intrigued me, and I immediately thought of the Baader-Meinof revolutionary group of the 1970s as I drifted over toward her table. Had they come back under another guise? Was the table about to explode? Were we safe? ​I asked to try the other Chassagne bottling. Two for two. Then I tried the Chassagne red. Good pinot flavor, judicious oak, well-integrated tannins. Man, they were on a roll! Working backwards, I tasted the Bourgogne blanc and rouge. Rich, pure, delicious! I was leaving Burgundy the next day, so I didn’t have time to visit the chateau. But a few weeks later I was back in France with the CNS Experience and went to the winery late one afternoon. We were met by Alain Fossier, father of Nathalie, the young lady who had been pouring at the Grands Jours. He told us that the Bader-Mimeur family has owned and managed vines in and around Chassagne-Montrachet since the 1700s. Charles Bader was a wine merchant at the Halle-aux-Vins in Paris. He married Elise Mimeur in 1920. Her father, Charles Mimeur, owned the Domaine du Chateau de Chassagne-Montrachet. Because of a family division, the chateau (located next door) is now run by another producer who markets wines from many other regions of Burgundy. 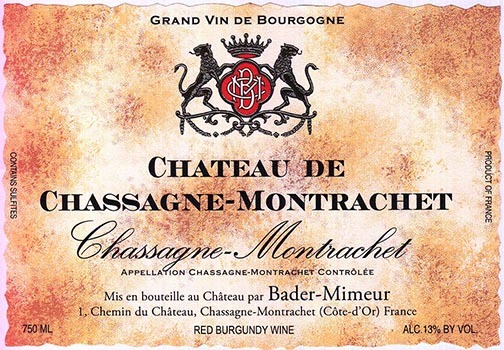 However, the Bader-Mimeur family owns and manages 98% of the vines of the Château de Chassagne-Montrachet as well as other vines located in the Chassagne-Montrachet and Saint Aubin villages. Alain and his wife Marie-Pierre Bader-Fossier are in charge of the domaine while Jean-Luc Huguenin is the vineyard manager and maître du chai, in charge of making the wines . The Bader-Mimeur family also has a very small negociant firm reserved for mainly French clients, with purchased wines from Pommard, Volnay, Meursault and Nuits Saint Georges, which are aged and bottled at the chateau. These are bought from producers that have comparable methods of growing vines and making wines. One of the amazing things about this domaine is the placement of their vines. The accompanying maps show their Bourgogne Pinot and Chardonnay coming from just outside the Chassagne appellation, while their Chassagne plots lie within extreme proximity to both Batard-Montrachet and Chevalier-Montrachet. The vineyards are plowed and pruning is short. Grapes are all harvested by hand. Fermentation begins with a pied de cuve, and the wines are aged in barrel for approximately a year. Bottling is done after a light filtration. ​Château de Chassagne Montrachet Chassagne Montrachet Blanc: Notes of petrol and exotic citrus fruit, with good acidic tension and palate-staining flavors. Bright acids keep everything in balance. Château de Chassagne Montrachet Chassagne Montrachet Rouge: Admirable ripeness with pinot notes of cherry and red berries. Background structure still allows the fruit to take the starring role. 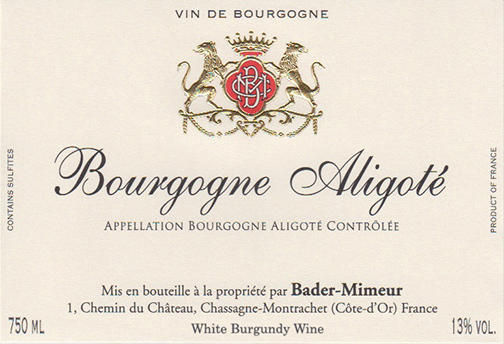 ​Bader-Mimeur Aligoté: While most Aligoté is has high acid and light body, this is bright yet rich, with layers of complexity that make it drink more like a Burgundy cru than something normally mixed with crème de cassis. 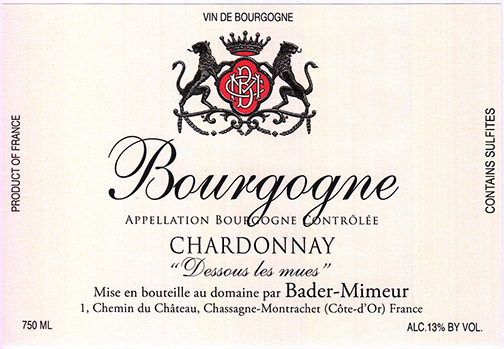 ​Bader-Mimeur Bourgogne Blanc Dessous les Mues: Bright, round and rich, with deep, mouthfilling flavors of exotic fruit and lively acids. ​Bader-Mimeur Bourgogne Rouge: Aromas of raspberry, tea leaf and cranberry, along with complex notes of menthol and forest floor. This wine has a velvety texture, and well-integrated tannins. Château de Chassagne Montrachet Chassagne Montrachet Blanc: Notes of petrol and exotic citrus fruit, with good acidic tension and palate-staining flavors. Bright acids keep everything in balance. 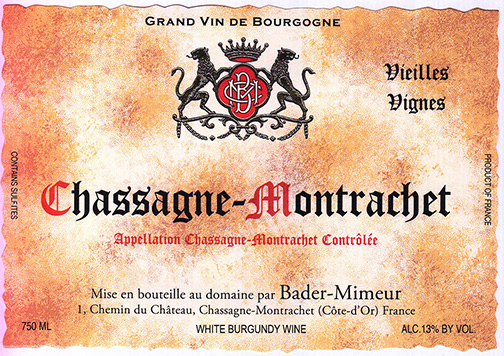 Bader-Mimeur Chassagne Montrachet Vieilles Vignes: Rich and round, with delicate apple and pear notes along with some excellent underlying minerality. 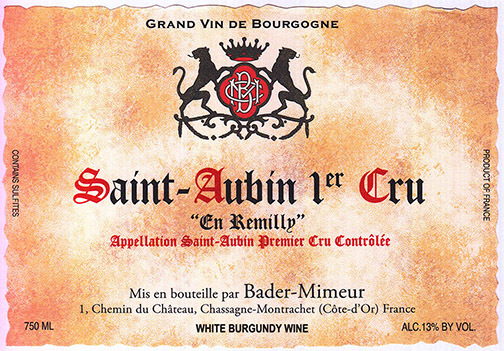 Bader-Mimeur Saint Aubin Premier Cru En Remilly: Comes from the parcels La Montagne and La Clairière de la Montagne, right next to Chevalier Montrachet. Rich, ripe and opulent, with tons of fruit and well-integrated oak. Big apple and exotic fruit notes, with some good palate-staining tannin. 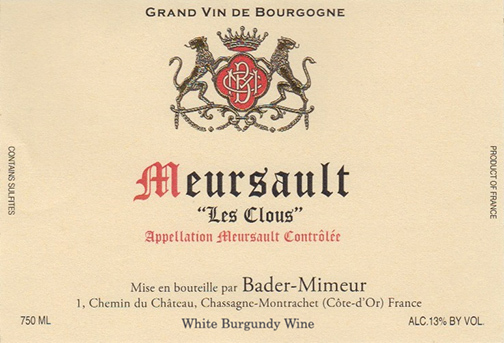 Bader-Mimeur Meursault: Purchased from a producer in Auxey-Duresses. Notes of exotic citrus, vanilla and petrol, with fine acids that push the big, ripe fruit.